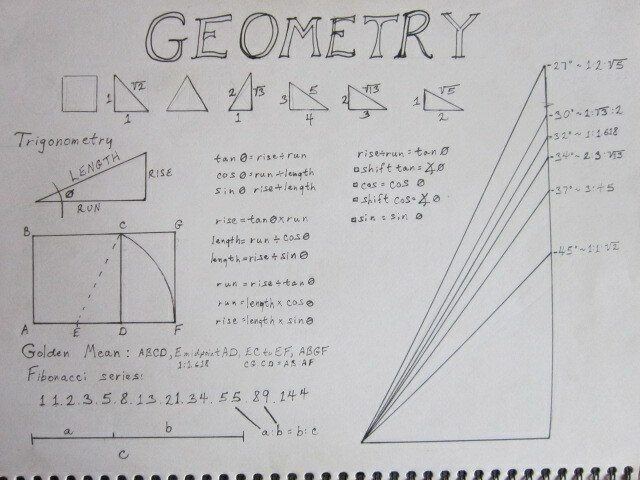 Trigonometry, once you understand the basics, is fairly easy to use. The sine curve/cosine curve model works great for electrical engineering, but isn’t very useful for building math. Really, just the ++ quadrant of a unit circle is sufficient for every trigonometry problem you’re likely to encounter as a carpenter. This is the intersection of an 8/12 roof and a 5/12 roof. The cricket has an 8/12 slope on one side, and a 5/12 on the other. Two of the valleys are regular, they are at an angle of 45º to plan. The other two valleys are irregular, one side is 5/12, the other 8/12, and the valleys lie at an angle other than 45º to plan. This requires a slightly more sophisticated approach than the conventional solutions. Here’s a simple isometric of the basic idea, with the individual triangles lined out in colors. The trick is to determine a common numerator, multiply through by twelve, then factor down by ten. These numbers will allow you to calculate all the lengths and angles necessary, then multiply by a factor to arrive at the actual measurement of the project. 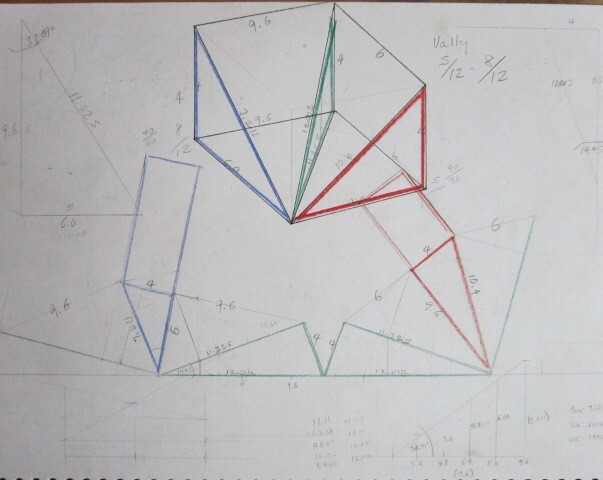 This drawing can be cut out and folded into a model. 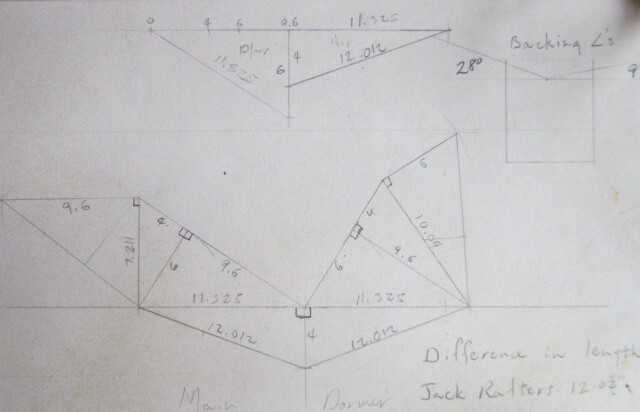 The perpendicular lines drawn across plan and roof plane represent the relationship of roof slope to level plane, and can be used as in the upper right drawing to determine backing angles. 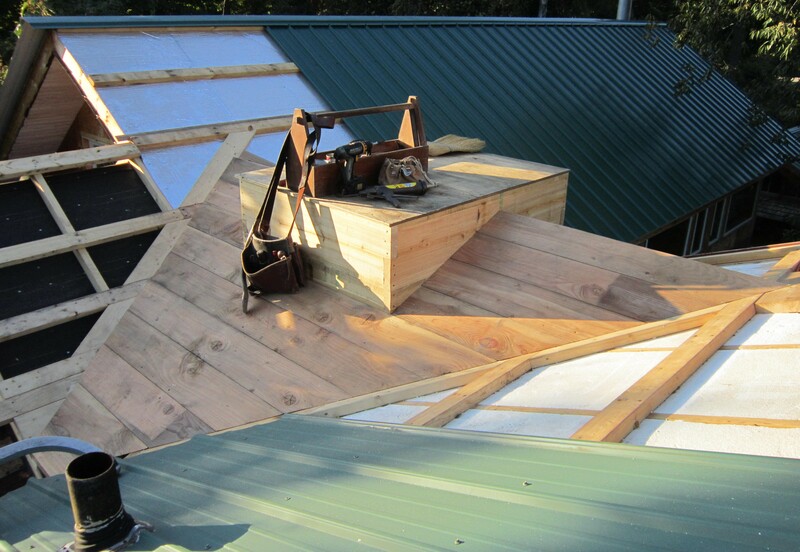 Backing angles are complement to decking bevels, and the roof plane triangle will produce decking angle. Rise/run=tangent. Inverse tangent=angle. A few keystrokes will produce sine and cosine, note them down and use the formulae below to solve for length. That box in the middle of the roof…Rhenish helm. 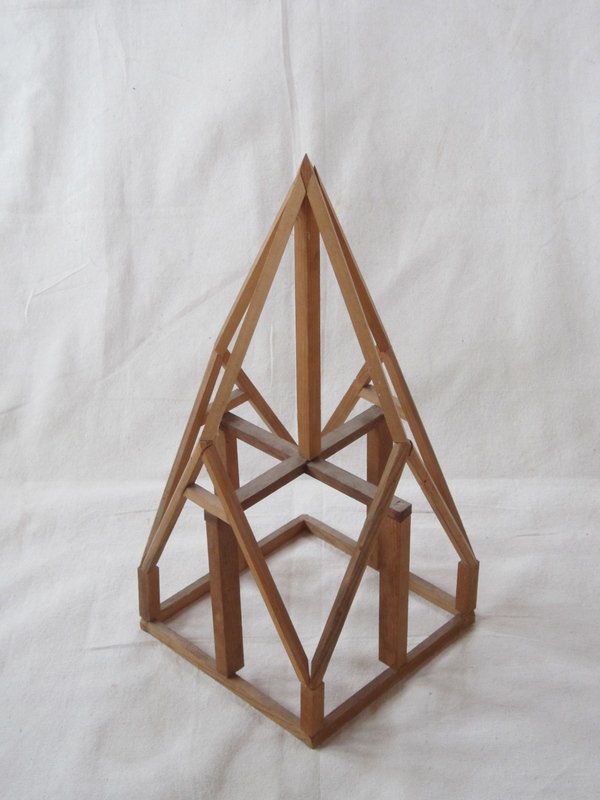 This entry was posted in architecture, carpentry, traditional building, woodworking. Bookmark the permalink.